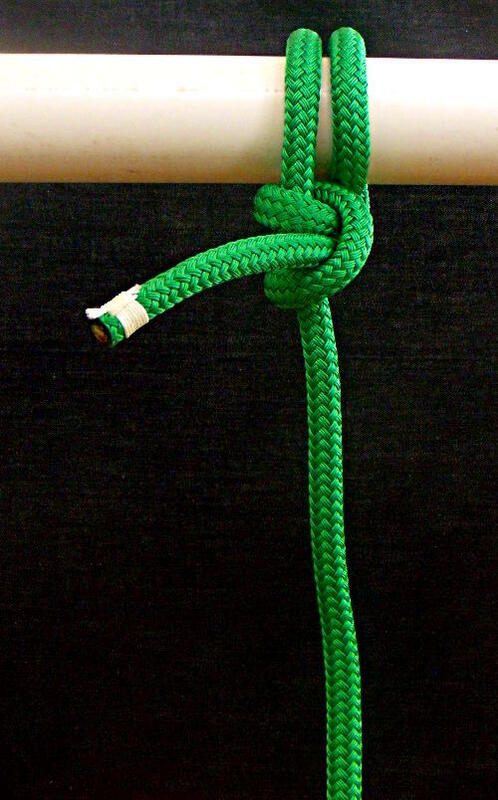 A great Fender Knot is the Round Turn and Two Half Hitches, it is also a great all around knot for both using on a boat and at home. I find the Round Turn and Two Half Hitches just as quick if not quicker to tie and much more secure than the more commonly used Clove Hitch. The Round Turn part of the knot provides friction on the item it is tied around, the friction lets you control a load with ease. When tying a fender the Round Turn lets the fender be held up using just your finger tips while tying the Round Turn and Two Half Hitches. 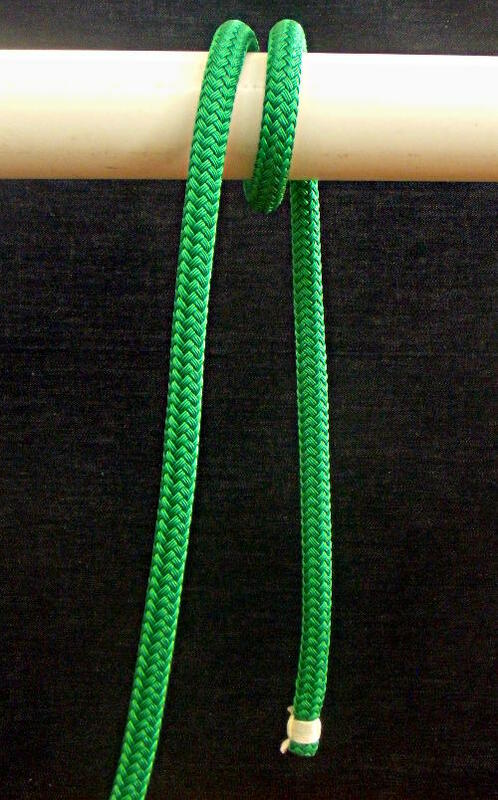 If I use a Clove Hitch, most of the time I will use Two Half Hitches to secure the Clove Hitch to keep the Clove Hitch from slipping. The Round Turn and Two Half Hitches is my preferred knot for Tying to a Bull Rail. A Towboat Hitch / Capstan Hitch is another great knot when you need to tie a line to a single post or a winch on a sailboat. Start the Round Turn and Two Half Hitches by wrapping the line a round turn around the object you are tying to. The Round Turn helps to control the load on the line, holding a line with the finger tips without the Round Turn can be very difficult even when the object being held is as light as a fender. Start the bitter end around the standing part of the line. The Round Turn and Two Half Hitches can be tied with the line wrapping either way around the standing part of the line. But once the line is started around the standing part, you must continue in the same direction. 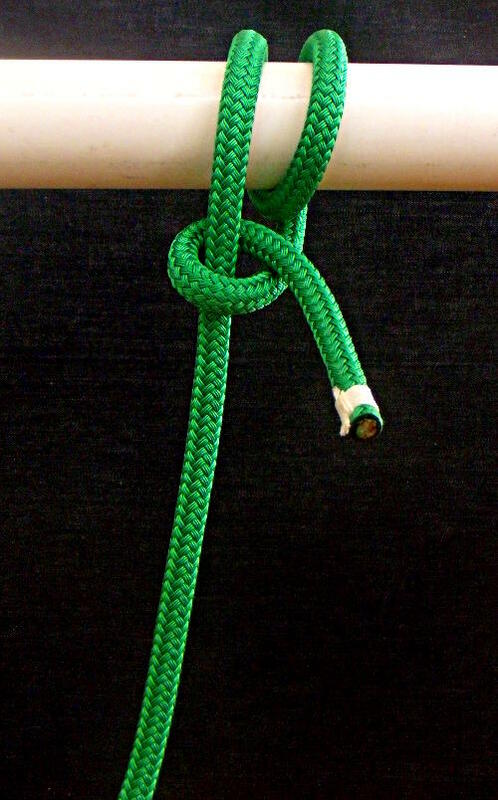 Tie a Half Hitch around the standing part of the line. 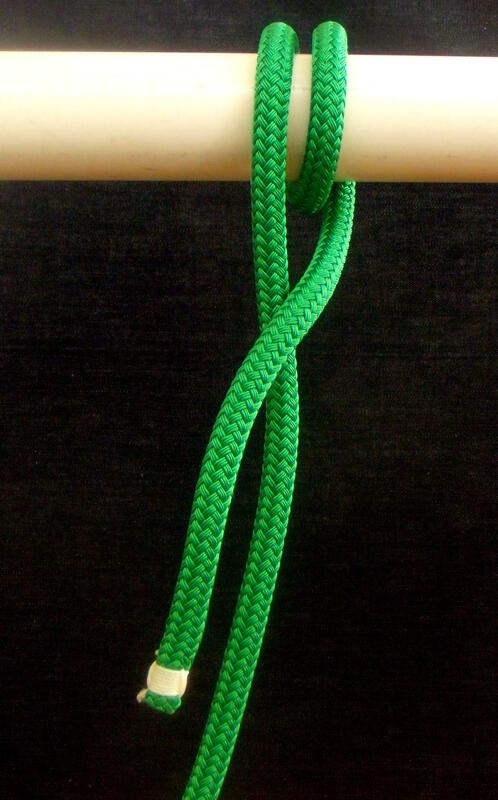 Continue tying the Round Turn and Two Half Hitches by tying the second Half Hitch around the standing part of the line. 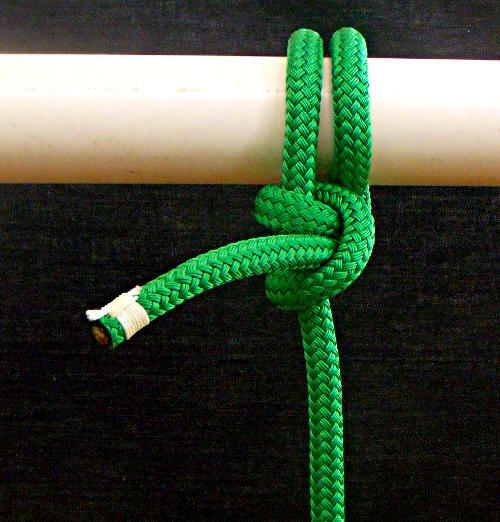 You have now tied a Clove Hitch around the standing part of the line. Word the slack out of the Round Turn and Two Half Hitches and the knot is finished. 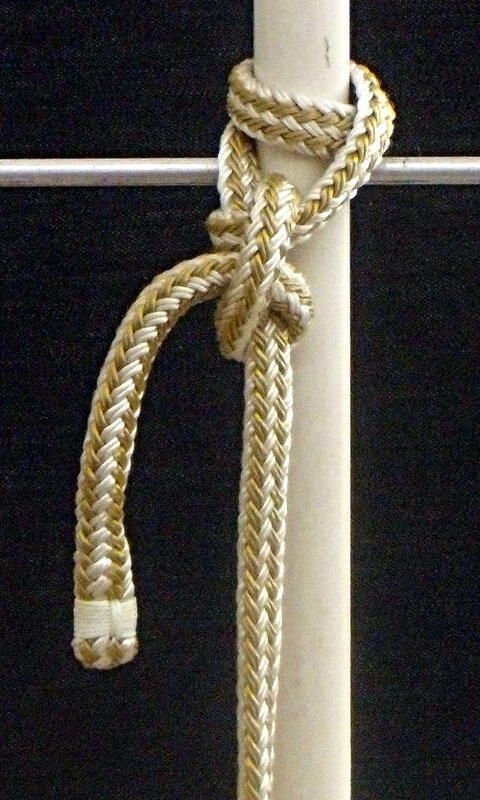 The Round Turn and Two Half Hitches makes a very good knot for tying a fender to a stanchion. This Fender Whip is tied with Double Braid line that has had the core removed. Removing the core makes the line hold knots better and the line is easier to handle. Instructions for an Improved Fender Whip, for fenders that have a hole for the line running length ways in the fender, Click Here. Instructions for an Improved Fender Whip, for fenders that have an eye on the ends for the line, Click Here. 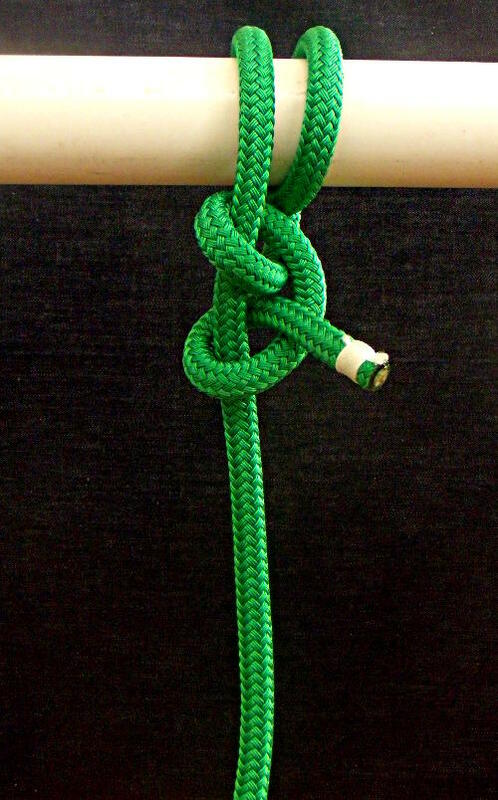 This entry was posted in Boating Safety, Sailing and Boating Skills and tagged boat equipment, crew skills, fender knot, knots, marlinespike skills, safety equipment. Bookmark the permalink. Thanks, Mike! I will use the round turn and two half hitches when securing your fenders from here on out. Your boat’s a beauty and I’ve been working to improve my jib releases, tailing, grinding, and winch handing since we last met. Hope to sail again with you soon!